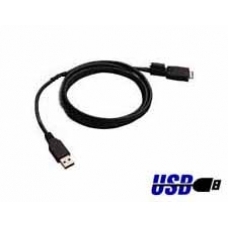 Genuine HP Universal iPAQ AutoSync cable provides easy synchronization of your iPAQ Pocket PC with your office or home PC through a USB connection. It is great to have one at both locations, and this cable takes up less space than the cradle when you are travelling. The official HP AutoSync cable can also be used to charge the iPAQ PDA as the AC adapter (not included purchase separately) can be inserted to provide power.